The youthful eyebrow is positioned above the orbital rim, with a gentle arch at the outer boarder. Age and gravity cause the brow to descend and lose its arch, often giving the face a tired or sad appearance. The brow lift or forehead lift procedure is designed to elevate the brow and restore the natural contour of the eyebrow, leaving the face looking rested and youthful. Dr. Khosh uses a variety of eyes & brows procedures to rejuvenate the forehead and brow. Commonly, the endoscopic brow lift or temporal brow lift techniques are used to achieve a dramatic and permanent rejuvenation of the forehead. The classic (open) forehead lift technique is reserved for patients with excessive forehead height. The direct brow lift can be used in male patients with deep forehead lines or in patients with facial nerve paralysis. 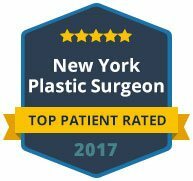 During your consultation, Dr. Khosh will review your options and discuss the benefits of each technique. In all cases, Dr. Khosh’s intent is to create fitting and natural results. 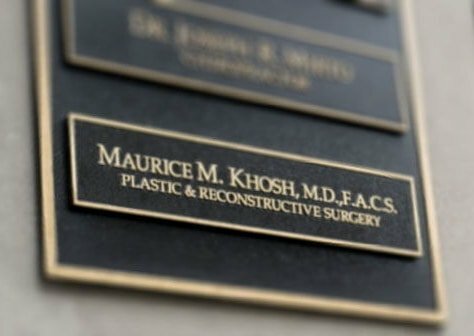 Dr. Khosh may also discuss non-surgical procedures such as Botox injections and complementary facial rejuvenation procedures, such as blepharoplasty and facelift surgery. Your consultation visit will allow you to ask questions and educate yourself about your treatment options Contact us today to schedule your consultation or feel free to inquire about other areas of aesthetic concern. This 42 year old lady requested consultation for brow lift in Manhattan in order to address a droopy eyebrow. The low position of the brow gave her a sad and tired look. The eyebrows were raised to achieve a natural and youthful upper face. Individuals who want a younger rejuvenated appearance to their upper face. Patients who complain about tired looking eyes due to descent of the brow are good candidates for the brow lift procedure. Can a brow lift eliminate the need for upper blepharoplasty in eyelid rejuvenation? That depends upon the severity of brow descent and extent of eyelid skin redundancy. In most cases, both conditions exist and the upper eyelid heaviness is related to the brow and the eyelid proper. When there is sparse eyelid skin redundancy but significant brow descent, brow lift surgery can supplant upper blepharoplasty. How does a non-surgical forehead lift or brow lift work? The non-surgical brow lift technique involves Botox injections to alleviate forehead frown lines, lines in the crow’s feet area, and depression of the tail of the eyebrow. The results last about four months, and the treatment can be repeated. Over activity of the muscles in the forehead causes frown lines. Botox injections into these muscles will relax them and erase the lines. In the lateral aspect of the orbit, over activity of the orbicularis muscle (the eyelid muscle which closes the eye circumferentially) causes wrinkles in the crow’s feet area and depresses the eyebrow. Botox injection in this area will smooth the wrinkles and prevent inferior depression of the eyebrow. What is the open brow lift or forehead lift procedure? This is the original form of the operation where an incision is made along the forehead-scalp hairline from sideburn to sideburn. Frown muscles can be cut or released. The forehead skin is freed from the underlying bone and advanced up. Some skin is removed and the incision is closed. This technique allows shortening an excessively long forehead. The disadvantage of this technique is a long incision and scar, and prolonged numbness of the scalp behind the incision line. What is the endoscopic brow lift or endoscopic forehead lift procedure? During an endoscopic brow lift procedure, four small incisions are created in the hair-bearing scalp, instead of the long incision from sideburn to sideburn. A small endoscope (video camera) is passed through one incision, and narrow instruments are used to perform the procedure with video monitoring. The endoscopic technique has several advantages over the open technique: The incisions are smaller, there is no numbness of the scalp, and recovery is faster. What is a temporal brow lift or temporal forehead lift? In a temporal brow lift procedure, only the brow in the region of the temple is lifted. This helps to restore the gentle upward curve of the eyebrow in the tail region. The incision is short and is located in the hair-baring area of the temple. 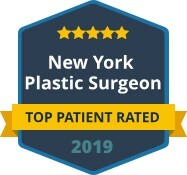 This incision can be easily combined with a facelift incision during a combined face lift and forehead lift procedure. The recovery from a temporal brow lift is quick, since the extent of surgery is more limited. How do I decide which brow lift or forehead lift procedure is right for me? During your consultation with Dr. Khosh, he will listen to your concerns carefully and examine your upper face and brow. An open brow lift technique is only indicated in patients who have excessively long foreheads. This technique allows shortening of the forehead to restore harmony to the facial proportions. The endoscopic forehead lift allows repositioning or the eyebrow and removal of the forehead frown lines with minimal incisions. The temporal brow lift only addresses the forehead in the tail of the eyebrow area. The temporal forehead lift is best suited for patients who do not complain about frown lines in the forehead. What kind of anesthesia is used during a brow lift or forehead lift procedure? Either general anesthesia or sedation is used in most forehead lift procedures. A temporal lift local be done safely and comfortably with local anesthesia alone. 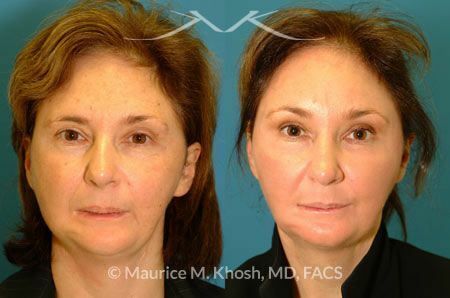 How long is the recovery from a brow lift or forehead lift? Discomfort from the procedure lasts about five days. The swelling or bruising will be mostly resolved by ten days. Most patients can return to full physical and social activities in two weeks. The final results from the procedure will be manifest in about three to four months. Forehead lift or brow lift aims to rejuvenate and revitalize the upper face. Related procedures such as blepharoplasty, facelift, neck liposuction, Botox injections, filler injections, and laser skin rejuvenation can augment and complement the aesthetic results of the brow lift.